1. Agricultural produce, the owner of which was not trusted with regard to the correct separation of the tithes. The tribe of Levi, having been excluded from participating in the division of the land, obtained as compensation a share in its produce (Num. xviii. 24). As the tribe included two elements, priests and Levites, the compensation was given in two forms: "terumah" (heave-offering) and "ma'aser" (tithe) for the Levites; and the latter gave the tenth part of the tithe to the priests as "terumat ma'aser" (heave-offering; ib. 26). In addition, a second tithe had to be separated from the produce in the first, second, fourth, and fifth years of the year-week. This tithe had to be taken to Jerusalem and consumed there, in accordance with certain regulations; while in the third and sixth years it was given to the poor. In the former case it was called "ma'aser sheni" (second tithe); in the latter "ma'aser 'ani" (the tithe for the poor). The produce of the seventh year was free from all these dues. The heave-offerings, both terumah and terumat ma'aser, could not be eaten by non-priests; the second tithe, unless redeemed with "silver," which was to be spent on food in Jerusalem, could not be eaten outside that city; while the first tithe and the tithe for the poor were not subject to any restrictions. Conscientious Jews would not partake of the produce of the land unless they had first satisfied themselves that the heave-offering and tithes had been duly separated. The owners of land in Palestine were divided into three classes; (1) non-Jews, to whom the Jewish laws about tithes did not apply; (2) the trustworthy Jews ("ne'emanim" or "ḥaberim"), who were sure to separate from the produce all that was due according to the Law; and (3) the 'Am ha-Areẓ, who was suspected of neglecting these laws. Produce bought of any person of the first class was considered as unprepared—i.e., as produce from which heave-offering and tithes had not been separated; that bought of the second class was "metuḳḳan" (prepared); and that bought of the third class was "demai" (doubtful, or suspected). The conscientious never partook of demai without first separating the tithes due thereon. It was not necessary, however, to separate all the dues enumerated above, as no one was suspected with regard to the heave-offering, for two reasons: first, it was not burdensome, as the minimum quantity satisfied the Law (Ḥul. 137b); and, secondly, the offense of neglecting it was considered very serious (Sanh. 83a). It was therefore only necessary to mark out the first tithe and the second. Of the former, one-tenth was separated as "the heave-offering of the tithe," and the remaining nine-tenths were retained by the owner, as the Levite was unable to prove his claim. The second tithe could be redeemed without the addition of one-fifth of its value (Lev. xxvii. 31). These regulations concerning demai are ascribed to Johanan, the high priest (John Hyrcanus, son of Simeon), who inquired into the matter and discovered the fact that most people only separated the heave-offering and neglected the tithes (Soṭah 48). 2. 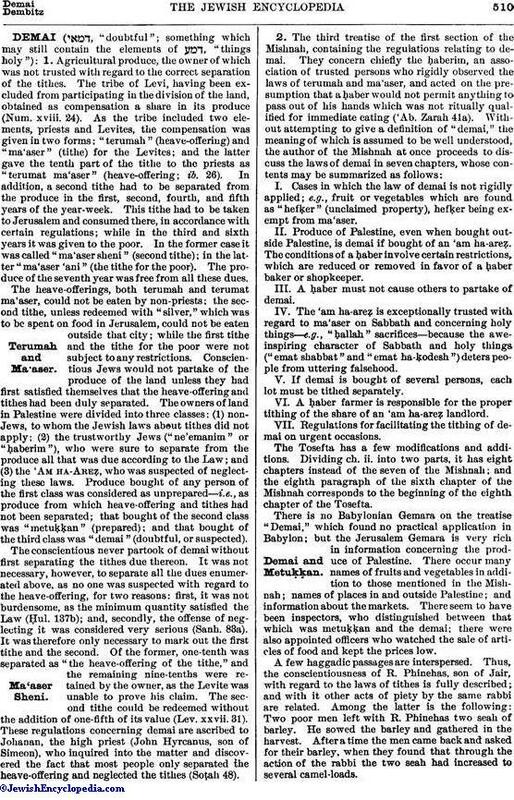 The third treatise of the first section of the Mishnah, containing the regulations relating to demai. They concern chiefly the ḥaberim, an association of trusted persons who rigidly observed the laws of terumah and ma'aser, and acted on the presumption that a ḥaber would not permit anything to pass out of his hands which was not ritually qualified for immediate eating ('Ab. Zarah 41a). 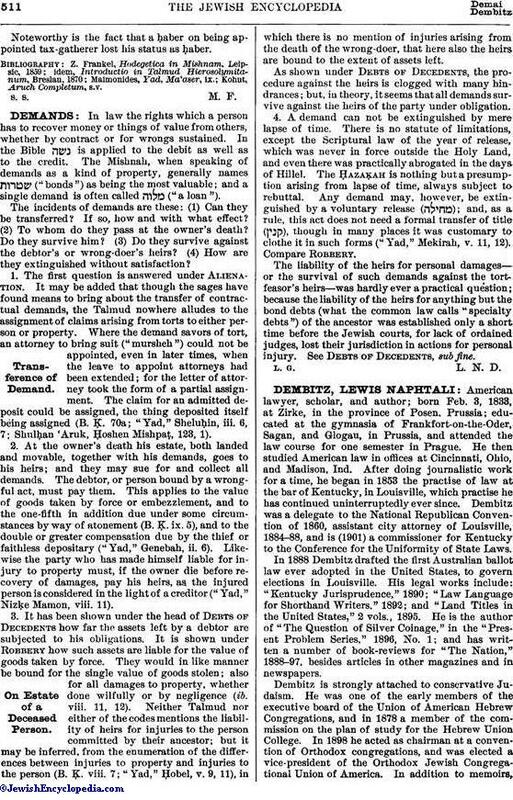 Without attempting to give a definition of "demai," the meaning of which is assumed to be well understood, the author of the Mishnah at once proceeds to discuss the laws of demai in seven chapters, whose contents may be summarized as follows:I. Cases in which the law of demai is not rigidly applied; e.g., fruit or vegetables which are found as "hefḳer" (unclaimed property), hefḳer being exempt from ma'aser.II. Produce of Palestine, even when bought outside Palestine, is demai if bought of an 'am ha-areẓ. The conditions of a ḥaber involve certain restrictions, which are reduced or removed in favor of a ḥaber baker or shopkeeper.III. A ḥaber must not cause others to partake of demai.IV. The 'am ha-areẓ is exceptionally trusted with regard to ma'aser on Sabbath and concerning holy things—e.g., "ḥallah" sacrifices—because the awe-inspiring character of Sabbath and holy things ("emat shabbat" and "emat ha-ḳodesh") deters people from uttering falsehood.V. If demai is bought of several persons, each lot must be tithed separately.VI. A ḥaber farmer is responsible for the proper tithing of the share of an 'am ha-areẓ landlord.VII. Regulations for facilitating the tithing of demai on urgent occasions. The Tosefta has a few modifications and additions. Dividing ch. ii. into two parts, it has eight chapters instead of the seven of the Mishnah; and the eighth paragraph of the sixth chapter of the Mishnah corresponds to the beginning of the eighth chapter of the Tosefta. There is no Babylonian Gemara on the treatise "Demai," which found no practical application in Babylon; but the Jerusalem Gemara is very rich in information concerning the produce of Palestine. There occur many names of fruits and vegetables in addition to those mentioned in the Mishnah; names of places in and outside Palestine; and information about the markets. There seem to have been inspectors, who distinguished between that which was metuḳḳan and the demai; there were also appointed officers who watched the sale of articles of food and kept the prices low. A few haggadic passages are interspersed. Thus, the conscientiousness of R. Phinehas, son of Jair, with regard to the laws of tithes is fully described; and with it other acts of piety by the same rabbi are related. Among the latter is the following: Two poor men left with R. Phinehas two seah of barley. He sowed the barley and gathered in the harvest. After a time the men came back and asked for their barley, when they found that through the action of the rabbi the two seah had increased to several camel-loads. Noteworthy is the fact that a ḥaber on being appointed tax-gatherer lost his status as ḥaber.